Gorgeous cards! I love the acetate technique you did - I must try that! BTW - I love your blog name! How fun! Thank you Lizzie! My blog name comes from a project I did with my son a few years ago. We 'card bombed" our town and had a lot of fun doing it! Your blending is amazing. So beautiful. Wow love the acetate technique and all your tipd. Your card id gorgeous. I love the background . Thank you for sharing your talents and inspiring me. I'm so glad you liked Tricia! Thank you! 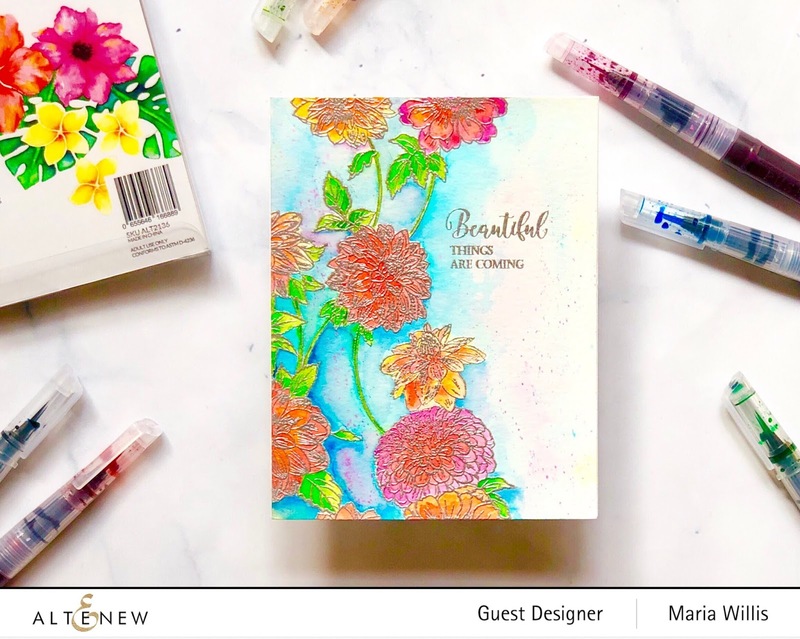 These markers are so vibrant and your cards are gorgeous Maria! These markers are amazing and thank you! Such bold, bright colors! Love your designs. Thanks Jackie! They really are easy to use! Absolutely gorgeous colors! Fabulous designs Maria! Thanks for sharing!! Such a lovely set of cards!! Fabulous new colors! Great technique with the acetate sheets! Love these cards. The watercolor markers are on my wish list. Thanks Joy! I hope you get the markers bc they are amazing! 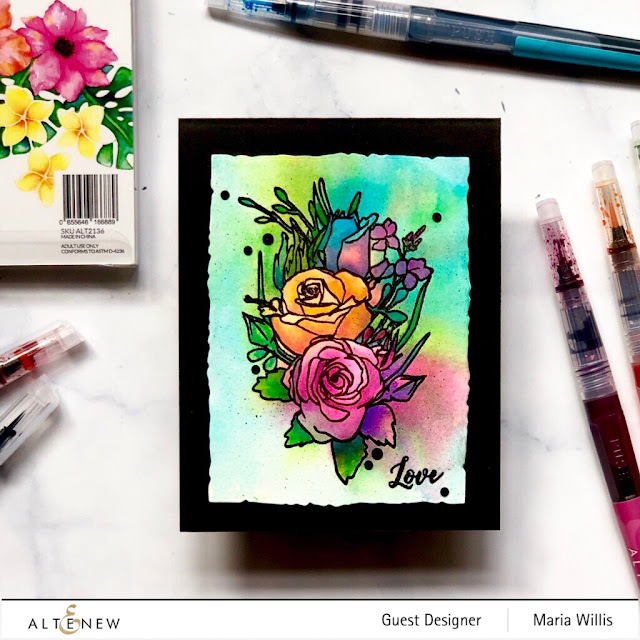 Love how you colored the flowers on that first card. :) So pretty. Your cards are lovely! I can't wait to try those brushes! Thank you Amee! I hope you'll love them as much as I do! Your cards are GORGEOUS!! I LOVE the way you colored each of the flowers in. STUNNING design. They really do blend well and thank you! You're colouring is just out of this world amazing Maria!!! Love all three cards!!! Stunning projects!! The coloring of these cards is gorgeous! I was so impressed with your beautiful card that I watched the video. What a great technique! I will have to try it. Thanks for the inspiration. Thank you so much for watching the video! I'm glad you liked the card! Thank you and I hope you'll have fun with the technique! 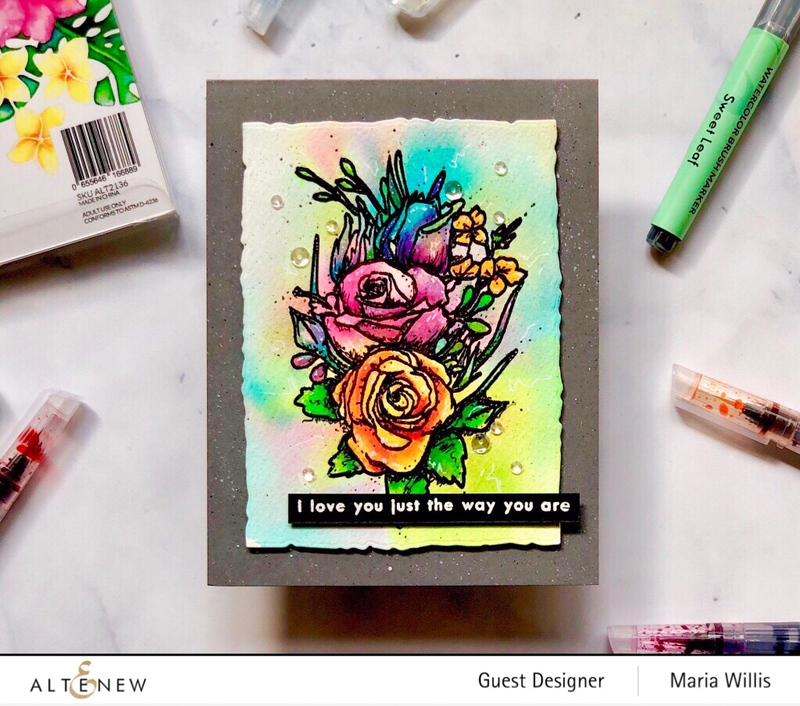 Love this card, your colors are beautiful! thank you for showing how well the acetate technique worked. I loved both of these cards but I think I liked the second one better. Your embossed card if nice to. All are very beautiful. Thank you! The second card was the easiest and quickest of the three so you're in luck if you decide to give the technique a go! 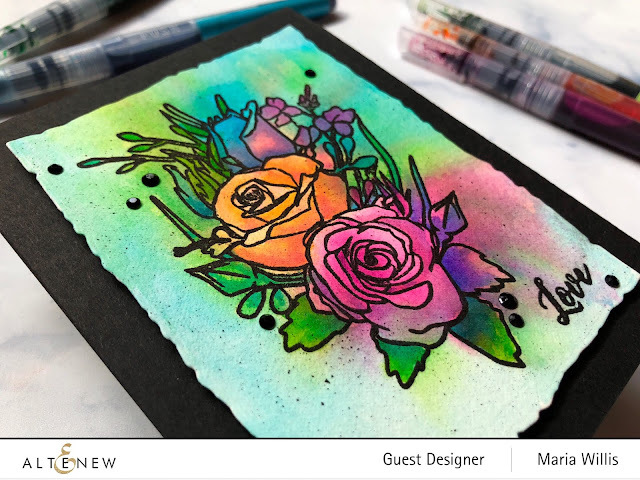 The background of the first card is reminiscent of the northern lights! Great technique. Ooh, the Northern Lights! Thank you Talitha! Both cards are beautiful! I love all the extra details you added on the first card and it definitely does give it more depth. I love the embossing on your second card also. Beautiful cards! Thanks for sharing the acetate technique in detail! I love your backgrounds and the sequin accents! Love your cards and the video. You make it look easy, although I know it's not!! Thank you and thanks for watching the video! It's really not too hard as long as you pick colors that blend well together. Love the cards the techniques, and the new colors! Thank you, and yes, the new colors are amazing! These are all so beautiful!! What a great technique with the piece of acetate! Fabulous cards! Gorgeous new colors of Watercolor Brush Markers. Love your great technique with the acetate. 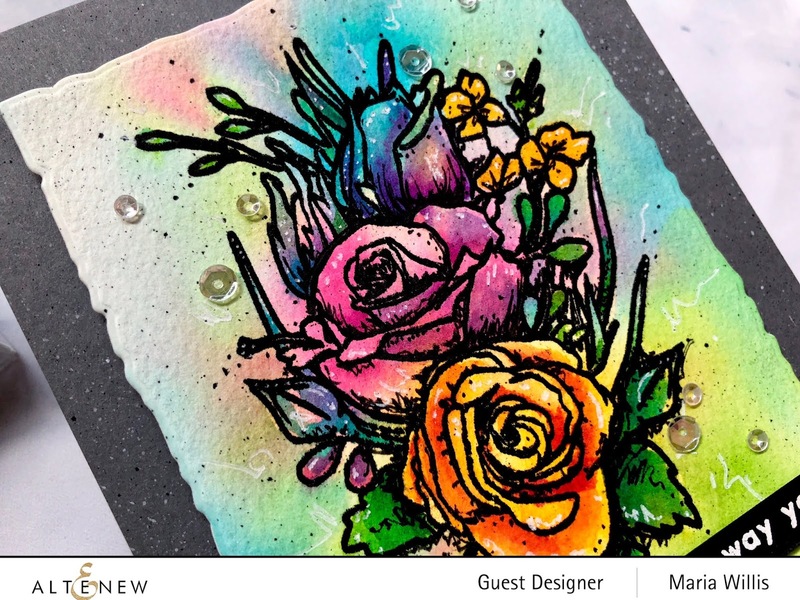 Amazing coloring on these lovely designs! Love these Tropical Fiesta colors! 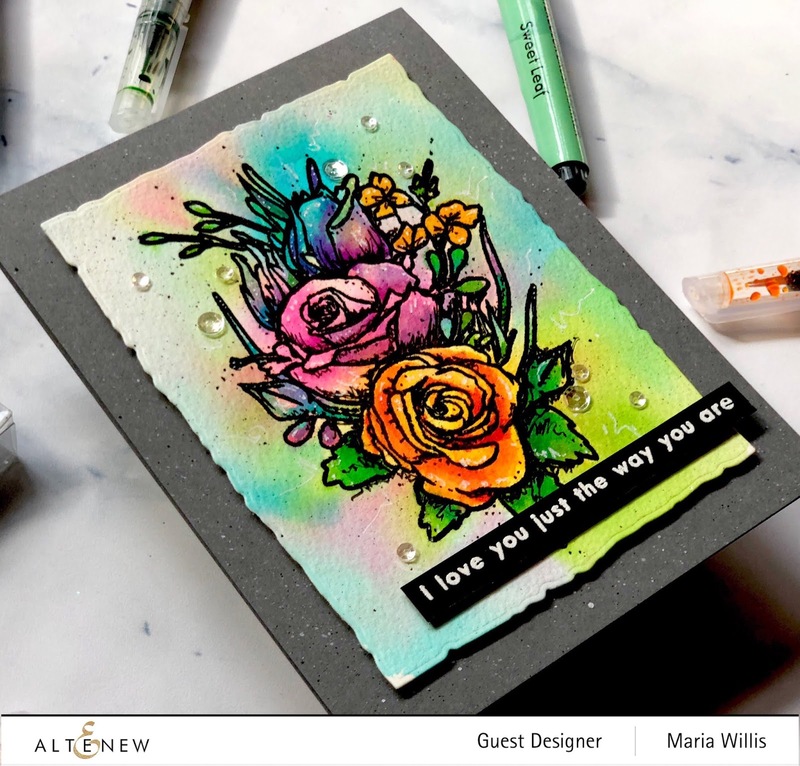 Beautiful cards ... your work is always so inspiring. What beautiful cards. Thank you so much for that very informative video....so detailed...it was awesome to watch. Thank you so much for sharing your talent today. Super new watercolor marker set. Love these beautiful cards. Thanks for the fabulous inspiration. And I love the name of your blog. Very creative and funky! That is a really cool technique. I actually like the controlled haphazard of the second card best without the extra details. Beautiful cards! Thanks for sharing your talent! Both cards are fabulous!! I love your technique. The colors are bright and vibrant. My kind of card!! Beautiful cards. I love your technique and the video had some great tips. Should we call it precision smooshing? Lovely! beautiful cards but I especially love the 1st card. 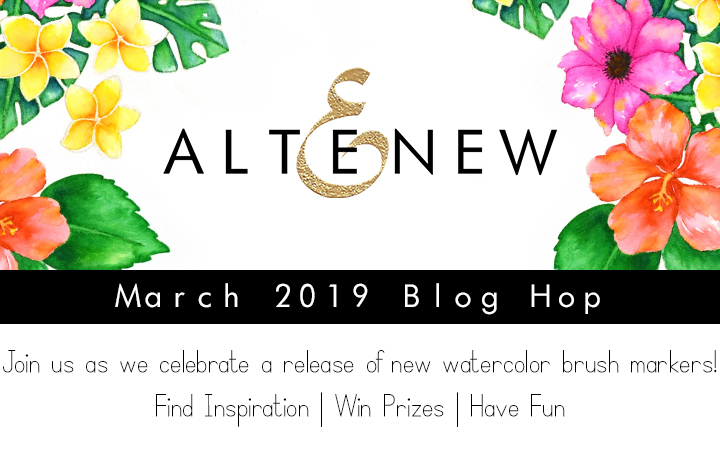 So excited to see you guesting with Altenew!!! What gorgeous projects!! Beautiful! Love the acetate technique! Beautiful cards. Love the extra detail you add with the sharpie and gel pen. Thanks for sharing. All of your cards are just amazing. And your video and technique for that first card are great! Love the idea! Thanks for the inspirtion! I’m absolutely in love with your 1st card. Definitely watching the video! Lovely job. Thanks for sharing your creativity! It's amazing how much difference the black and white pens make. The flowers look so much prettier and sharper than without them. I really like the smooshing technique. Thanks for the video. I really like the addition of the pens. I need to remember to try that. Lovely cards! Your acetate technique looks like fun, so when I get these pens I will definitely try it. It seems that no matter what colors you use, they just pop! Wow, amazing colouring and both projects just stunning. Lovely cards and amazing colouring. I appreciate your time in creating a video. Beautiful cards. 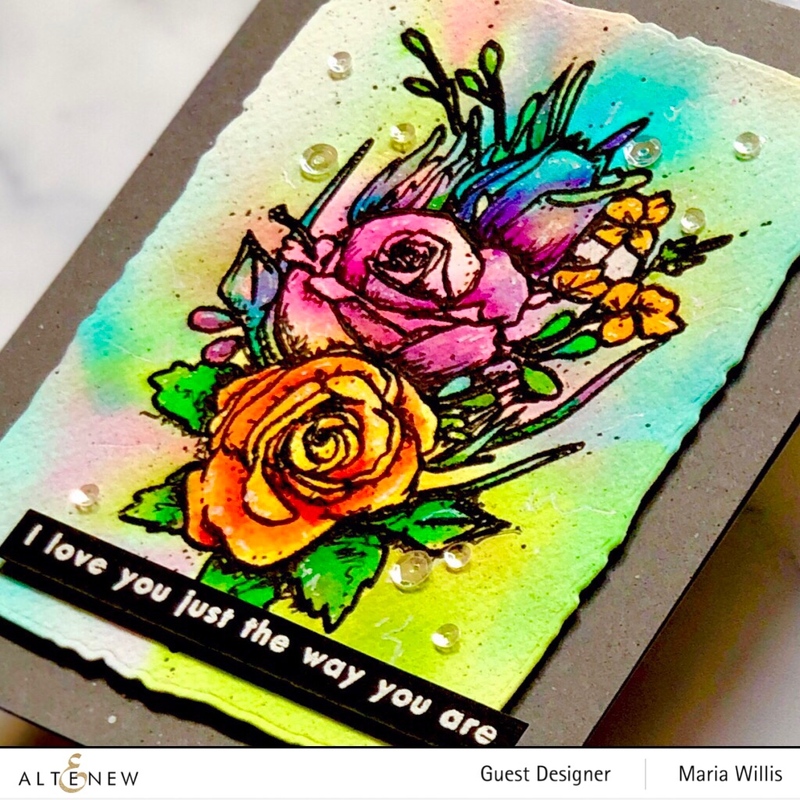 I love the embossed card and all the detail you were able to get in the floral images. On your first card I thought the background was stunning. Thanks for sharing your time and talent with us. Your cards are stunning! I love the new colors and how you combined them all! Thank you so much for the wonderful inspiration! Beautiful coloring, as always, Maria! Thanks for sharing your process for these amazing markers. Appreciate you showing completely different styles on your sample cards. Inspiring ! Gorgeous cards! Thanks for the great tutorial! I love the vivid colors in this new Tropical Fiesta set! Your card is gorgeous and the background is stunning. All three are gorgeous,especially the last one! Love these new vibrant colors! Great idea to use the acetate. underwater feel - fun picture. 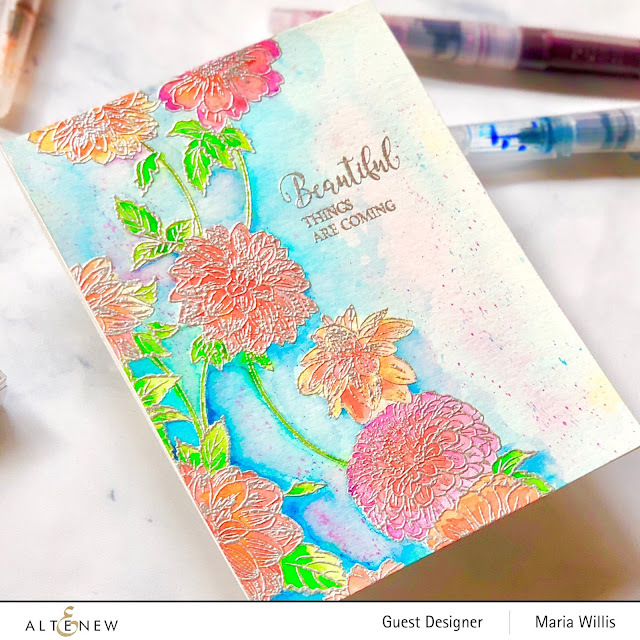 Lovely cards - your first one is breathtaking. I love the varied colours in the background, and those bold colourful flowers - it gives a magical feel. Beautiful cards, Maria, and I appreciate the time you took to share three different techniques for using these newest watercolor markers! Love the depth of color, and the idea to use the acetate is a new one for me. One I will try, for sure! Thanks for sharing! Your acetate background is beautiful! How pretty! Both cards that is. Beautiful cards! Your colouring techniques are gorgeous! Oh my your cards are Stunning, you rocked those watercolors... Great Job! Your cards are so different and really give lots of thoughts on different ways to use these bright new colours! 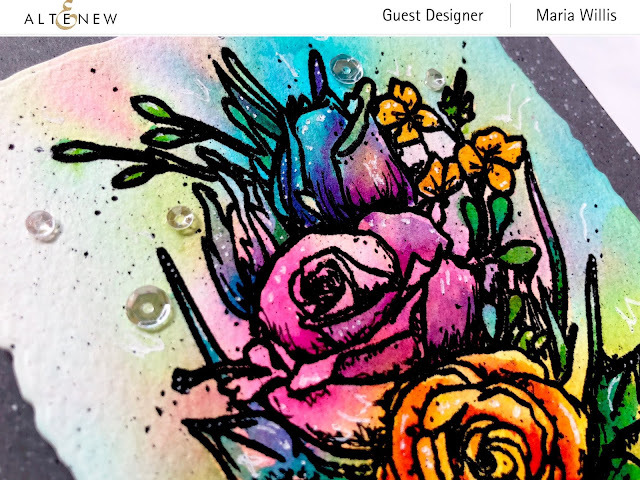 Your clever designs are just gorgeous and so eye-catching! Thanks so much for sharing and the great inspiration! What a great idea to use acetate to get a loose-but-controlled background watercolor. 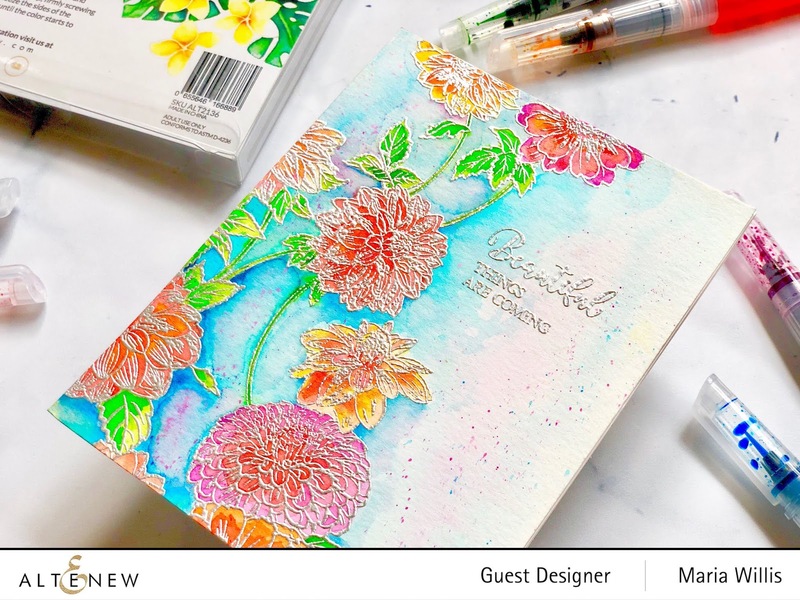 And it's really interesting to see your two different cards with this stamp; I can really see where you added all the details, and I'm so impressed. Thanks for sharing your cards with us! All 3 cards are amazing! These are stunning! I especially love the first one, it's got such an artsy mixed media feel to it! Wowza Maria! Your three cards are stunning :) Thanks for the inspiration! Oh what beautiful and striking cards! Amazing intensity of color and your watercoloring is gorgeous. beautiful ink-smooshing and choice of colors. luv the delicate look of your last card!